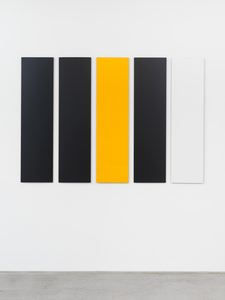 Magenta Plains is pleased to present Don Dudley: Early Work, an exhibition featuring the artist’s signature monochromatic, sprayed-lacquer modular paintings and related works on paper dating from the 1970s. 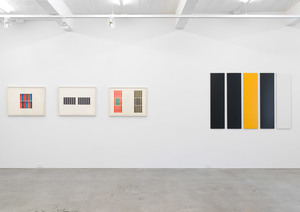 This is the artist’s second solo exhibition at Magenta Plains. 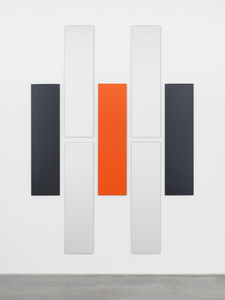 Throughout his seventy-year career, Don Dudley has challenged artistic conventions and the traditional concept of painting by incorporating industrial materials in his work such as aluminum, lacquer, homasote and plywood, creating subtle and sophisticated wall works that stand out for both their elegance and formal intelligence. 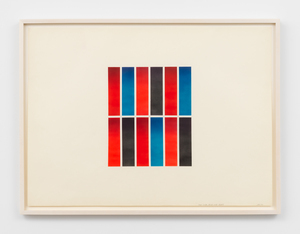 Dudley’s oeuvre is a crucial historical link between the optical and surface-oriented sensibility of West Coast artists such as Robert Irwin and Craig Kaufman and hard-edge and minimalist East Coast artists such as Frank Stella and Ellsworth Kelly. 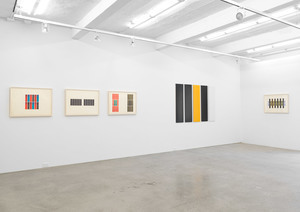 The analytical artistic methods in New York—especially the visual language of grids, modularity, and the aesthetics of industrial manufacturing—had a profound impact on Dudley’s approach to painting, and after moving to New York from California in 1969, he shifted his attention to structure and seriality. 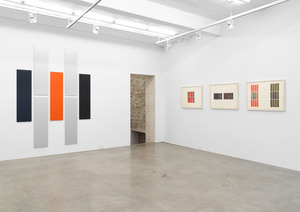 Throughout the 1970s and 1980s he explored modular and serial structures with monochromatic color schemes as well as site-specific spatial installations—solidifying a connection to artists such as Anne Truitt and Donald Judd. 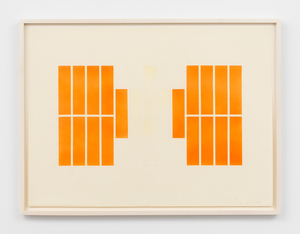 Dudley’s concise and rigorous visual vocabulary of repeating, geometric forms is best exemplified by his sleek, grid-based configurations of aluminum panels flawlessly sprayed with solid shades of opaque silver, blue, black, white, yellow, orange, and red. 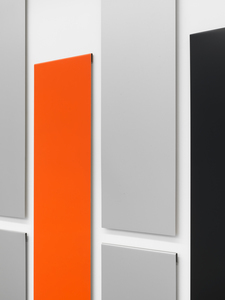 As modular works, the panels function interchangeably and have been configured to engage with the space they occupy—each metal support measuring 46¾ by 12 inches, crafted with a bend at the top edge so they float slightly off the walls. 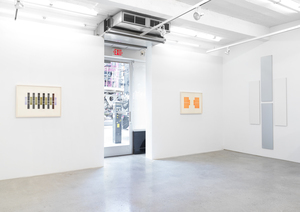 An integral and crucial aspect of his work, Dudley’s generative drawing practice consists of highly meticulous works on paper featuring rows of vertical rectangles and color progressions—“some primaries, some meditations on darkness, others a delicate mix of sublime white and lavenders.” For him, the drawings function as an index for future works while the wall pieces are about the immediate present experience. 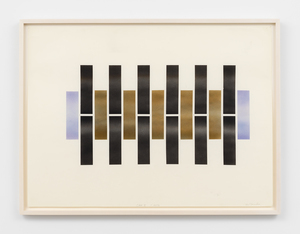 Dudley’s phenomenological approach to his work emphasizes atmosphere, affect, and pure visual experience with no narrative to distract. 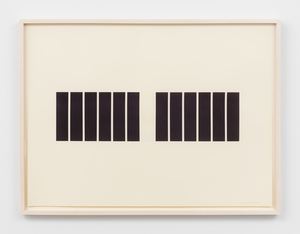 His motive has always been to express the richest variety of visual phenomena by the simplest means possible. 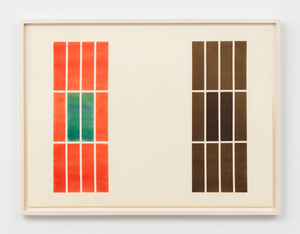 Like many of his peers and friends, Dudley’s early work channels the sublime and the industrial through a lifelong examination of color, surface, material, precision, and intellectual rigor with an enduring and astounding significance. 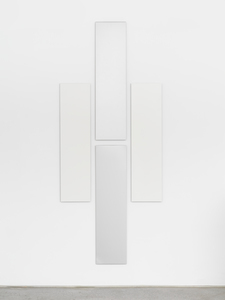 overall 95.50 x 68 in., each module 46 3/4 x 12 in. 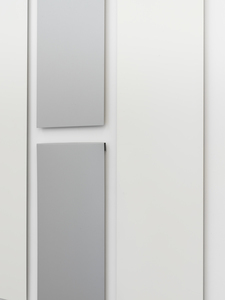 overall 46.75 x 68 in, each module 46.75 x 12 in. 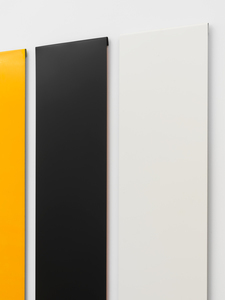 overall 95.5 x 40 in., each module 46 3/4 x 12 in.